In this drama, the dapper Don Draper has to fight to stay on top of the cutthroat advertising business in 1960s New York City. As if his demanding career wasn't enough, he also has a wife and kids to contend with. Jon Hamm, Christina Hendricks and Elisabeth Moss star. In the series finale, Don Draper's story comes to an end. Don struggles with sleeping. Pete is blindsided by a burdensome friend. Confronting a new challenge, Henry arranges a family reunion. Don is honored for his work. Joan clashes with her co-worker on an account. Roger avoids making a big decision. Don has a break through and comes up with a great idea. Roger seeks out Joan to help him fix an error. Peggy struggles with casting for a commercial. Roger passes off a project to Don. Joan goes on a business trip. Peggy and Pete disagree over an account emergency. Roger offers Don unwanted advice. Peggy and Stan clash over an account's personnel. Harry seeks Don's blessing. Don searches for a missing friend. Joan tries to deal with a problem with an account. Don is unsettled after reading a letter; Peggy considers a risky venture; Roger receives a phone call; Pete and Cutler clash. Peggy works on a pitch, Pete is invited to a private club, Joan hopes to spend more time with a friend. Sterling Cooper & Partners anxiously await the arrival of a guest. Don calls an old friend. Roger deals with problems at home. Pete underestimates Peggy. Don goes on an unplanned trip. Betty meets with a friend. Harry tries to make a point. The partners consider a questionable asset. Flowers are delivered for Peggy at the office. Pete feels his way through the politics of new business. Joan is put in an uncomfortable situation. Don makes a new friend, Joan shares drinks with a client, and Roger gets an odd phone call. In the sixth season finale, Don faces a major problem. The partners struggle to agree on a new campaign; Don takes a day off. Betty plans for Sally's future, while Peggy deals with trouble at home. The agency works to maintain a client; Joan is surprised. Roger is plagued by a nightmare; Joan goes to the beach. Don encounters a surprise visitor; Peggy searches for inspiration. Sterling Cooper Draper Pryce attempts to anger competing clients; Pete is completely caught off guard by an unexpected guest. Roger changes his method in an effort to make new business; Pete has an awkward encounter with a client. Peggy plans for the future, while Roger tries to schmooze a potential client. The partners work to maintain a secret campaign, while Joan is visited by her past. Don disagrees with a client, Pete keeps a guest busy, while Peggy finds it challenging to motivate the staff. In the second part of the sixth season premiere, Don launches a new campaign, Roger is shaken up by new information, and Betty welcomes a houseguest. In the first part of the sixth season premiere, Don launches a new campaign, Roger is shaken up by new information, and Betty welcomes a houseguest. It's part of the #LoveYourMellons campaign. Is Jon Hamm the Next Batman? The hunt for an Affleck replacement is on. Are Jon Hamm and Kate Beckinsale a Thing? The pair was recently spotted getting cozy at Hamm's movie premiere. Have you seen the alternate ending to "Mad Men?" You should. So what exactly happened with Don Draper? Series creator Matthew Weiner confirms. The "Mad Men" star quietly checked in to a rehab program last month, according to reports. Alexis Bledel and Vincent Kartheiser have tied the knot! 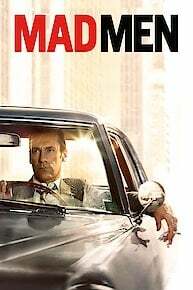 Mad Men is currently available to watch and stream on AMC. You can also buy, rent Mad Men on demand at Netflix, Amazon, Vudu, AMC, FandangoNow, Google Play, iTunes online.